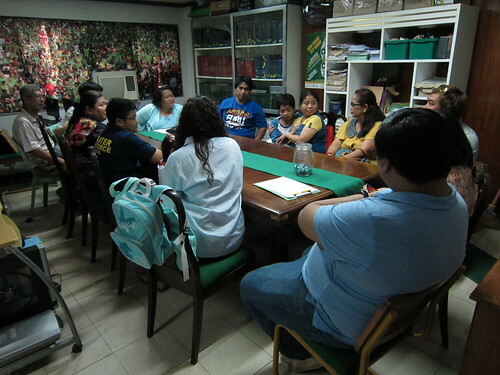 Ms. Mona Magno-Veluz welcomed 12 participants and facilitated the ASP Family Support Group held last 21 March 2015 in Autism Society Philippines office in Quezon City. ASPs monthly family support group sessions bring together parents, siblings and other family members to talk about their journey in living with autism. Participants share their experiences and draw enlightenment and strength from others going through the same challenges. This session highlighted concerns of parents and sibling through a wide range of ages from 3 to 25 years old. The exchange covered concerns from school and therapy choices, disciplining CWAs, public stigma, friendships, work placement and hopes for the future. Tears were shed as stories unfolded; but all left our humble office with their heads held high and their hearts filled with hope, knowing that families who live with autism are not alone in their advocacy for a better future for their children and siblings.